We want you to be part of the Motus Mechanical community. Let us know what you would like to see in terms of datasheets, videos, demos, or anything else. The goal of our company is to grow to better serve our customers' needs. Currently, the best way to stay up to date on Motus Mechanical is to subscribe to our YouTube channel and see all the product videos and tutorials. And remember, we value your feedback. Feel free to contact us with comments and requests for future videos. Subscribe to our YouTube channel and check out some of our videos we've listed below. We hope you find them informative and inspire you to all the possibilities you have MechBlocks. And remember, we value your feedback. Let us know how we are doing and feel free to recommend or request ideas for new videos. Introductory tutorial showing how to assemble modular blocks using thread inserts, half-round washers, and screws. Flexure spring rotary stage with open aperture. Resolution can be increased by increasing length of lever arm. Reconfigure fixtures immediately. 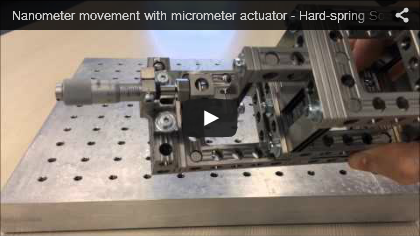 The three gage nest holds sensors for machine tool metrology or other measurements in engineering applications. The hard-spring soft-spring translation stage produces nanometer resolution movements from coarse adjustment actuators. Analogous to a voltage divider. 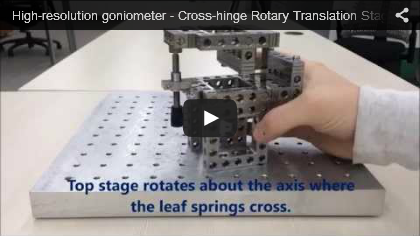 Goniometer with high resolution angular adjustment using crossed flexure leaf springs as a rotation axis. 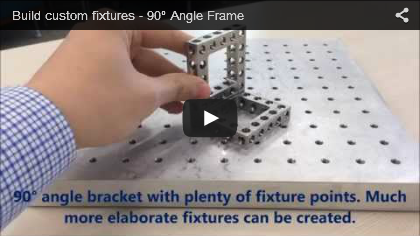 A 90° angle frame with many fixture points for clamping workpieces, sensors, actuators, or more framework. 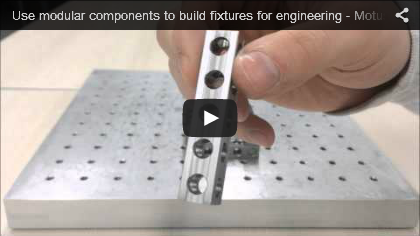 Custom fixtures on demand. 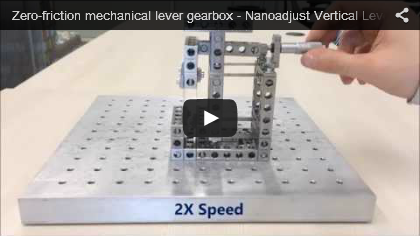 The nanoadjust is a mechanical lever gearbox, converting and reducing horizontal displacement to vertical displacement using flexures. 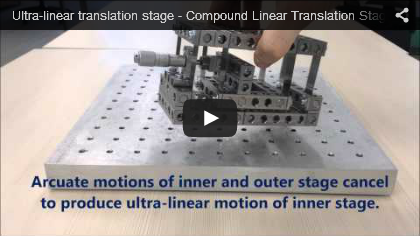 Ultra-linear flexure translation stage with open aperture for photonics applications. 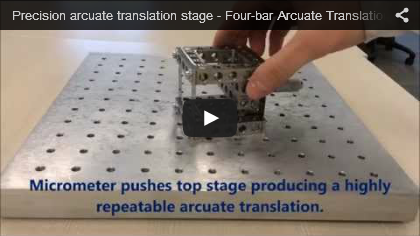 A differential adjustment translation stage. One application is an optical slit for photonics or optical engineering. 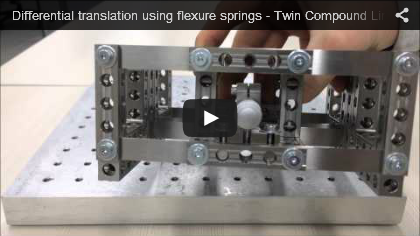 Four-bar flexure translator producing repeatable translations for engineering motion control applications. How straight is straight? 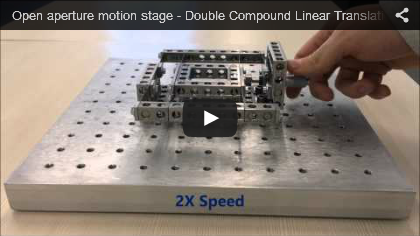 Ultra-linear flexure translation stage for mechanical engineering applications. 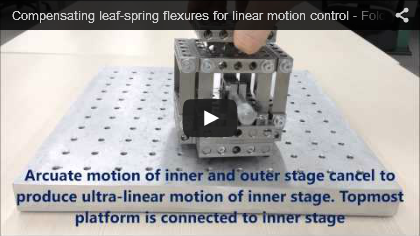 Folded leaf-spring flexure design for ultra-linear translation in demanding mechanical engineering applications.